TREIRB PGT Final Selection List, PGTs Subject wise Selection list Results 2019,TREIRB PGT Social Studies Final Selection List Results 2019, TREIRB PGT Biological Science Final Selection List Results 2019, TREIRB PGT Telugu Final Selection List Results 2019, TREIRB PGT Mathematics Final Selection List Results 2019, TREIRB PGT Physical Science Final Selection List Results 2019: TREI-RB - General Recruitment to the posts of Post Graduate Teacher (ENGLISH) in TREI/ TSWREI/ MJPTBCWREI/ TMREI Societies Notification No.02/2018, Dated:30.06.2018 Selection Notification: TREIRB has notified that on the basis of the Written Examinations held on 04.10.2018 and 06.10.2018 and subsequent Certificate Verification process held on 10.01.2019, 11.01.2019 Et 17.01.2019 at Telangana Social Welfare Residential School/College (Girls) Narsingi, Ranga Reddy District for Direct Recruitment (General) to the post of Post Graduate Teacher (PGT) English subject in TREI/ TSWREI/ MJPTBCWREI/ TMREI Societies, four twenty-one (421) candidates with the following Hall Ticket Numbers have been provisionally selected for appointment to the post of Post Graduate Teacher (PGT) English subject in TREI/ TSWREI/ MJPTBCWREI/ TMREI Societies, notified vide Notification No.2/2018, Dated:30.06.2018. The selections are published subject to the following conditions. TREIRB has released the following subject wise PGTs selection list on its website. Candidates who were appeared the PGT Recruitment and attended the certificates verification, they can check their name in the selection list results. 3. That the candidates should produce such original certificates as required in accordance with the Rules/Notification. If it comes to the notice of the Board later that any candidate furnished false information or the selection is not in order due to any act of omission or commission of any candidate, then his/her provisional selection is liable to be cancelled at any stage and they will forfeit all consequential benefits including that of selection. Besides that, the Board reserves the right to take any action as it deems fit in the circumstances of the case duly following the relevant Laws, rules, regulations and executive instructions and all enabling legal provisions of Govt. of Telangana. In respect of the General Recruitment process of other posts of Post Graduate Teaches (other subjects), in various Telangana Residential Educational Institutions Societies notified in the Notification No.2/2018, selection notifications will be issued separately. 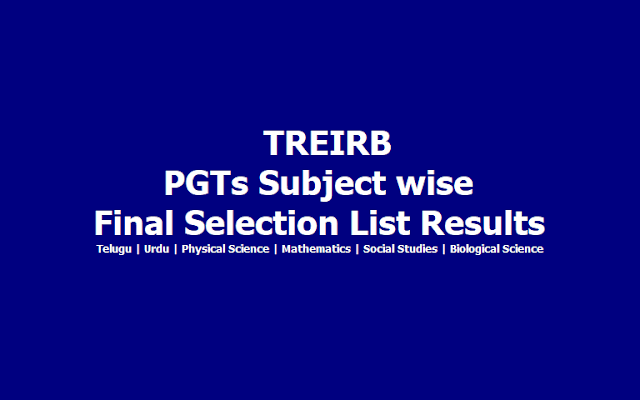 TREIRB PGT Selection List Results: The Selection list Results of the PGT exams conducted from September 28 has been released by the Telangana Residential Educational Institutions Recruitment Board (TREIRB) on the official exam website of the Board, www.treirb.org. A Selection List Results link to the exam website can be found on the official website of TREIRB, treirb.telangana.gov.in. The candidate has to visit the selection list of English PGT exam. How to download the PGT Selection List Results 2018? Step 6: Then, You can see " Hall ticket no. allotted in TREI/ TSWREI/ MJPTBCWREI/ TMREI Societies"